After testing the Keithb motor mount design with extra weights it held up fine. The crossbeam appears to extend deep into each hull giving ample support. Nice design that is easy to construct. Thanks Keith. It looks nice. One question: why is it so far to the stern. it seems there would be less stress if it were closer to the crossbar. Look up a few postings to the photo of my motor tipped up on the mount. I don't have the rudders or tiller on, but you can see there wouldn't be a lot of clearance if it were mounted closer, particularly when you turn the rudders, which moves the tiller bar further back. So far, the only disadvantage to Keith's design that I have found is the square bar is not as torsionally rigid as the round Cheeta arm. So when you turn the motor a lot at high throttle, it twists the bar. It doesn't seem to hurt anything, but it's a bit unnerving! Last edited by dorienc on Sun Nov 20, 2016 4:28 pm, edited 1 time in total. I only use the motor to turn when backing up. Going forward using the motor, I always steer with the rudders and lock the motor straight ahead.. More comfortable seating position and have not noticwd any torsional effect that way. Why does the motor need to be so far back? Seems to me, as long as there is no interference with the tiller cross bar , it wouldn't need to be so far back. seems to me it just puts unneeded rotational stress on the rear cross member. Thanks. In my case if the motor mount was placed closer to the cross member it would interfere with the tiller while turning when the motor is raised. And by the way, I did end up adding a supporting crossbar near the rudder supports to ease the torsion on the rear crossbar. The right hull was flexing enough to keep the cooler from shutting completely. The outboard weighs 37 lbs empty. Do you have any pictures of the additional crossbar and how you attached it? First time posting pics so lets see if it works. I used a galv fence top rail painted black . Not bad. Where did you get the pole for the crossbar support? Galv fence top rail from home depot. 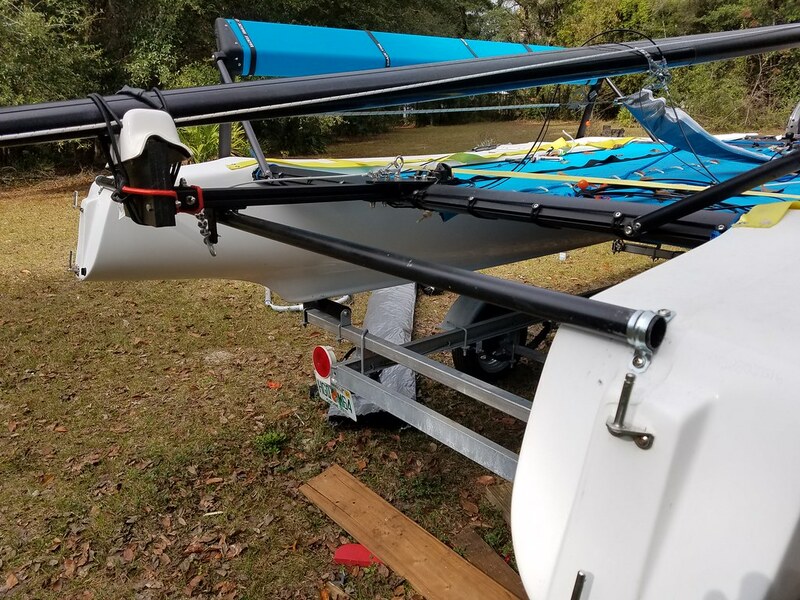 I didn't notice before but now I see you are using the motor mount to support your mast/cradle for trailering. Definitely would not recommend that without the secondary rear crossbar support. I just moved the mast cradle off to the side of the motor mount for trailering. 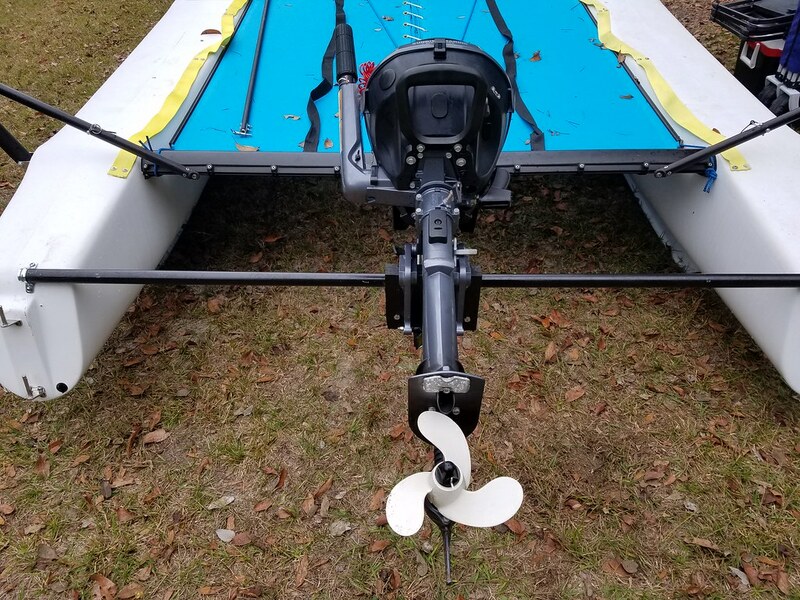 I would like to fab one of your outboard engine mouts and I have a Hobie 17. Is every thing more or less the same ?